PaddyAnglican: The new Boss has moved in! The new Boss has moved in! Headed up to Dublin yesterday for the consecration of our new Bishop, Trevor Williams. The venue was Christ Church Cathedral and what a wonderful occasion it was. Beautiful music - as many bishops as you could shake a crozier at, though no sign of Bishop Brennan! We were also greatly honored to have the President in attendance - having recently attended our General Synod and now a Consecration I think she has become an Anglican by default! I wonder does she realize? ;-) The occasion was also noteworthy in the person of the preacher, one Dom Mark-Ephrem Nolan, Superior of the North's only Benedictine Monastery. I include his sermon below because it was nothing short of superb and a useful challenge to anyone who holds leadership within a Christian Church. Only one small incident detracted from the general feel good factor of the day and that happened before the ceremony even began. I was sitting in the window of Jurys opposite the Cathedral sharing a sandwich with a few clerical colleagues including a now retired former bishop of Limerick who was wearing his episcopal purple. A man in his early thirties came over to the bishop and patted him on the back and said to him: 'Enjoy your breakfast which you are eating at the expense of the starving children in Africa!" and then he walked on laughing at his own dubious insight. My first thought was what about the beer you just had at the bar - you plonker!? At whose expense was that? - I was about to follow him and challenge him as the bishop was still a little stunned but I thought twice of a punch up before a consecration! Now that really would be a story! It wasn't fear that held me back - I am a lot bigger than this individual - what held me back was the realization that this is how we in the institutional churches are perceived - hypocrites! No doubt this is sometimes deserved, though certainly not in this case where the bishop in question was the co-founder of Bothar, a charity that has done some great work in the Two-Thirds World and continues to do so! I wonder how our ignorant friend would have felt if he had known that? But the fact remains - we as Church are seen as hypocrites and we will not change that by punch ups in hotels but by our actions. As long as people suffer and we live in relative comfort we will face this charge. It is not about to go away and perhaps it never will! To some we will always be hypocrites - all we can hope to do is make it harder for this label to stick. To some the events of yesterday might seem like outdated and irrelevant pomp and ceremony - to others including myself if was an inspiring mountain -top experience. But we cannot live on the mountain-top for ever - we must also come down to earth and engage with the world, however cynical it may be, and show this world that the Church exists for the world and not for itself. Following is the text of the address by Dom Mark-Ephram Nolan OSB, Superior of the Holy Cross Benedictine Monastery, Rostrevor at the consecration of the Rt Revd Trevor Williams as Bishop of Limerick and Killaloe in Christ Church Cathedral, Dublin, on Friday 11th July 2008. Thank you, Archbishop John, for consenting to the invitation Trevor extended to me and in your turn welcoming me to Christ Church Cathedral. It is a great privilege to open God’s Word on this great day in this hallowed place. We are one in the spirit we are one in the Lord! That phrase captures something of what we feel today as we gather to celebrate this liturgy which has brought us together from right across the Christian family here in Ireland, north and south of the border, and from further afield. The Episcopal ordination and consecration of our friend and brother, Trevor, has brought us together in Jesus Christ. The other day I asked Trevor if he had chosen a motto, a word from the Sacred Scriptures to guide him in his ministry. Let me read his e-mail response to me: I am inspired by the vision of Ephesians 1 & 2. Together in Jesus Christ seems a motto which catches much of what I want to share with others. Trevor’s motto and accompanying remarks will come as no great surprise to those who know him. They are typical of the man. A particular thrust and hallmark of his ministry up until now has been to bring people together in Christ – one immediately thinks of his work in the domain of the media, his membership of the Corrymeela community and the leadership role he played therein and of the work in which he was so wholeheartedly engaged in North Belfast until very recently. To bring people together in Christ will undoubtedly stand at the heart of Trevor’s exercise of the new ministry confided to him today. It cannot be otherwise, for this is Trevor’s particular charism, part of his personal gifting from the Lord which the Church has recognised and invites him to use now as Bishop for the good and for the up-building of the whole Body. If the vision of Ephesians 1 & 2 inspires Trevor especially, can I propose that we consider for a few moments the overall vision and purpose of this Pauline Letter? … In a phrase the overall vision and purpose of Paul’s Letter to the Ephesians could be summed up as being to strengthen the believers in their relationship with God and with each other. Trevor, can I make so bold as to exhort you to make this your primary intention as you undertake your new ministry in the service of the People of God in the diocese of Limerick and Killaloe and indeed in the whole Church of Ireland? In the new ministry confided to you, seek to strengthen the believers in their relationship with God and with each other. That is quite a mandate, I know. You might ask: how can I do this? To begin with, by strengthening your own relationship with the Lord, for this is the source from which all else will flow. A key verse from Paul’s Letter to the Ephesians comes to mind as I look at you, Trevor. It is found in chapter 6, verse 10: I want to remind you that your strength must come from the Lord’s mighty power within you. I am confident that the Lord’s mighty power is and will continue to be at work within you since, to quote the first reading heard today, it is the Lord, the God of the spirits of all flesh who has appointed you over the congregation to go out before them and to lead them out and bring them in. Remember that it is the Lord Himself who has commissioned you. Remember too, as Jesus always did, something you told me you learned from your mother as a child: namely, your Heavenly Father will always look after you. … Remember that especially on those days when for whatever reason you begin to feel overcome with anxieties, doubts and fears and, as a result, feel tempted to lose confidence in God, in others and in yourself. In encouraging you to develop an ever deeper personal relationship with Jesus, I am certainly not suggesting that you become caught up only in your own affairs; rather I am encouraging you to be Christ-centred in all the affairs of God’s People. Remember that what the people ask of you as their bishop is that you be Christ-centred. This is what the people want you to be, not just for yourself, but for them. They want you to be able to lead them to Jesus; they want you to be able to help them to come to know Christ better. You owe it to the People of God whom you have been called to serve to be constantly in-touch with Jesus Christ, so that when you reach out to them they sense that it is Christ Himself who is ministering to them through you. Remember, Trevor, it is Christ’s healing, His reconciliation, His new life and His hope you are called to bear witness to … this you will do effectively only if you are experiencing these graces constantly for yourself. The gospel text we have heard today couldn’t be any clearer on the importance of a deep, loving, relationship with Christ. Three times it asks you – as it asks all of us – this fundamental question: Do you love me? The late Henri Nouwen judiciously remarks: We have to hear that question as being central to all of our Christian ministry, because it is the question that can allow us to be, at the same time, irrelevant and truly self-confident. I like the word irrelevant that Nouwen dares to use here. However much the word irrelevant may jar with those who are obsessed with their relevance, however hard it is for some of us to hear it, I am sure that it is a word that all the Churches in Ireland need to take to heart today, not with bitterness, not with sadness, not with regret – and certainly not with nostalgia for the good old days when we were, as we thought, so relevant … when, in fact, we were perhaps just far too dominant … domineering even! The more discreet place the Christian Churches hold in Irish society today is a better place from which to truly minister. It should be seen as salutary. For, it brings us back to our real vocation which is to be yeast in the dough. That we have lost some of our privilege is no bad thing. It is good to be brought back to the gospel call not to want to lord it over others, but to stand in their midst as a humble servants. The Church is called to be the humble servant of the Lord in our world. One of the greatest obstacles to true Christian witness is when we Christians take ourselves to be more important than we are and strive to cling to privilege. The true Christian Leader – following the example of Christ Himself – and the Church in which he serves, should strive to be a self-effacing servant. For, that’s how Jesus lived his ministry: in a self-effacing way. We see this over and over again in the unfolding of the gospel story, but perhaps it is illustrated nowhere better that in that very beautiful Emmaus gospel scene where we see how once the disciples recognised the Risen Lord in the breaking of bread, suddenly He disappeared from before their eyes. I suggest that perhaps our divided Churches could learn much from a contemplation of Christ’s self-effacement at this moment. Was it not when Christ was no longer visible to Cleopas and his companion that they came to recognise Him in each other in a new way and that they realised that they were being called to return to the others whom they had left behind, the group still gathered in Jerusalem. When Jesus disappeared from their view the Emmaus road travellers felt the need to restore contact with their fellow disciples. When they sought these out their discovery was a confirmation of their own faith: Yes, it is true. He is alive! We have seen Him too! He has appeared to Simon Peter! Like Cleopas and his companion, we all need to return to those from whom we have estranged ourselves in the wider community of the disciples. The Jerusalem disciples welcomed the Emmaus pilgrims and shared their good news with them. … He has appeared to Simon Peter! We have an allusion there to the gospel story we have read today. In the light of this beautiful gospel passage, let me remind you, Trevor, that the Lord’s call in your life – that you should serve as bishop – engages you to be for your brothers and sisters an icon of the Risen Jesus. It calls upon you to love and care for the sheep as He did. It calls upon you to show your love by tending to the flock to which He sends you. Jesus asks: Do you love me? He goes on to say: Feed my lambs … look after my sheep … pasture them! To love Christ and to pasture the flock, this is to be the heart of your ministry. This ministry you are called to exercise not alone, but with others. To speak of being together in Christ, as you do in your motto, implies that you work together with others in the various ministries which build up the Body of the Christ, the Church. The opening words of this Service made that abundantly clear. It is evidently your desire to minister with others. These others will be your brother bishops of the Church of Ireland, your brothers and sisters of the Episcopal order within the Anglican Communion worldwide (you prepare to meet with many of these at The Lambeth Conference – we cannot all but feel the call to hold the Communion in our prayer at this time when her unity is menaced), your desire will be to minister in close collaboration with the priests, deacons and readers of your Local Church … as indeed it will be to work together with all the People of God, over and beyond diocesan and denominational boundaries. Among all the human relationships to which you should pay particular attention, Trevor, one you should seek especially to reinforce at this time is your covenant bond of love with Joyce. For, it is an essential part of your witness. This is also teaching drawn from Paul’s Letter to the Ephesians, teaching not to be forgotten: the love you share is a sacrament of Christ’s love for the Church. As Bishop you will discover just how much people will look to you to give a lead. Please be wise here; don’t get things wrong in your response to them. Don’t be tempted to think, as they might be, that everything depends upon you. It doesn’t! In every authentic Christian ministry all depends upon Christ! When people turn to you asking you to “fix things” for them, dare to disappoint them. Remind them that you simply can’t “fix” everything. Your mission is to lead the people to see that we must all look together to Christ, whom the epistle to the Hebrews refers to as the one great Leader of our faith. For this reason, let me come back to something I hinted at earlier when I picked up on Nouwen’s word irrelevant. Don’t take yourself to be more relevant than you are! Don’t take yourself too seriously! Whatever else you do, don’t oust Christ. Don’t usurp His place. While, as bishop, you do hold the place of Christ in your diocese, remember that this means that you are Christ’s lieu tenant; to hold Christ’s place is not to be His replacement. If the Fathers of the Church could say that where the Bishop is there Christ is, remember that this only further underlines how important, how absolutely vital, it is for the Bishop to be where Christ is – in prayer before the Father! I would like to end where I started. We are one in the Spirit we are one in the Lord. Those words came to my mind as I woke from sleep the other day in the form of the 1970’s Christian song with which you – and others here – will be familiar. … To our shame maybe too many of us who once sang these lyrics in our churches, chaplaincies and meeting halls have forgotten them. Some may prefer to forget they ever sang them because they don’t ring as quite sophisticated enough to our now more refined ears. … But, it would be a great pity to leave them entirely forgotten, for they commit us to work together in Christ. And that is a commitment we really need to make in Ireland today – all of us! Thank you for reminding us of this. To do that … Let’s set aside our privilege and crucify our pride! Then they’ll know we are Christians by our love! … They will know we are Christians by our love! Sorry to miss you at Christchurch. I too was moved by the occasion and Dom Mark-Ephrem's fine address (it's on the CofI website, and you could have linked it there). Did you spot the lovely Freudian slip on the invite & order of service? 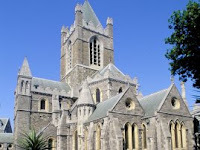 Christchurch is really the Cathedral and Metropolitical Church of the Holy Trinity! Can't you just see someone worrying about the political implications of seating this divine here, and that divine somewhere else! Yes - I did glimpse you at one stage but I made an early escape to beat the rush hour traffic. I got the sermon from the website but I decided to reproduce it as I know that sometimes people do not follow links. Bothar? The charity that sends animals to Africa? I see. So we have massive subsidies for our European farmers, and the Americans have massive subsidies for their cotton growers, allowing all of them to produce gigantic surpluses. We then dump this excess produce on the African market, swamping the local farmers who can't compete with the level of subsidy. They go out of business because the local people naturally buy the cheaper imported goods. We then come up with a scheme to make our subsidised farmers feel better about this appalling turn of events. Here. Have a goat! Maybe your mystery heckler knew more than you realised. On a brighter note, best of luck to Trevor. Don't forget you promised to bring him into Limerick for pints some night. I want to be able to say that I went on the piss with a bishop. Not Pie in the Sky when you die! Lambeth - A tale of exclusion! We are a broad Church - All are welcome! Guess who might be coming to visit! The best funeral sermon ever!